Knitwear designer Jo Cranston tells us about exhibiting in 3 Christmas Open Houses! Hi Jo, where are you exhibiting your work in the Christmas Open Houses? Firstly at Milton House at 72 Clyde Road Brighton, which is offering mulled wine and a chance to meet the new open house kitten Percival (Percy)! Host, Sarah Jones, was nominated best artist in May and also been on the best Open House shortlist for the last 8 years. This exhibition is open for ONE DAY ONLY – Sunday 25th November 10am – 5pm, and is presenting 12 superb quality fine artists & makers! Can you tell us a bit about your work – how it is inspired by English themes such as road signs and the weather? I am a knitwear designer with over 20 years of experience, making collections of luxury merino wool accessories, cushions and throws from my studio here in Brighton & Hove. My current collections, ON THE ROAD and CLOUDS featured here, are inspired by my daily bike ride and by a very British obsession with the weather! I began by taking photographs, of clouds and rain, of sun-rays over the sea and the road markings on my journey to work. Back in the studio I rearranged the road markings into simple graphic shapes, double yellow lines and zebra crossings, then programmed them into the knitting machine. Once knitted up into scarf lengths, each piece formed a miniature length of road. My other half said they were “Perfect for cycling” then added “can I have a shorter version that doesn’t flap about?” I’ve now designed a safer cycling muffler and expanded the range to include Double Yellows, Zebra Crossing, Dotted Line and No Parking! My CLOUDS collection of scarves, gloves and cushions are inspired by the amazing skies we see here between the sea and the downs. 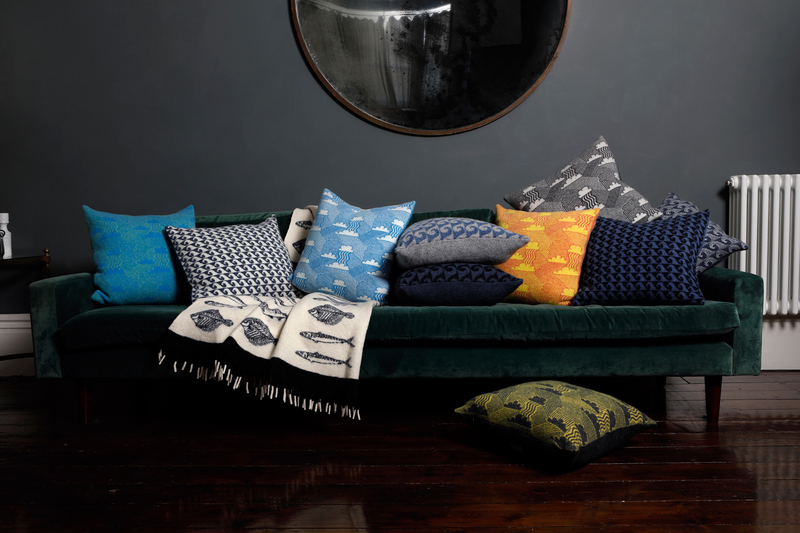 The cushions and scarves feature a repeating pattern of cumulus clouds, driving rain and sunbeams. The thing I love about working in this city is the wealth of creative small businesses making Brighton & Hove such a unique place. Over the past year I’ve been working award winning Emma Wood Photos, who I recently commissioned to shoot the fashion shots here. The stylish interior and vintage furniture are courtesy of the talented Brighton business Revival Vintage (instagram@revivalvintage01) and my website was created by Nifty Website Design, who calmly look after everything technical including my online shop. You began life as a designer in Brighton after studying textiles and fashion at the University of Brighton – can you tell us about your subsequent experiences in New York? After graduating from Brighton University in 1991, I was lucky enough to be employed by Holly Henderson’s knit studio in New York, it was exciting work designing sweaters and hosiery on Shima Seiki computers that were still being developed specifically for knitwear design and production. I went on to design for several companies in New York and London during the early 1990’s before starting my own knitwear studio in Islington in 1992. Initially I planned to sell knitted swatches to fashion designers so that they could produce the garments themselves. I had always admired Paul Smith’s menswear and decided to give him a call. After a meeting in his Floral Street office, full to the rafters with books, paintings and bikes, he chose three felted wool swatches, then handed me some waistcoat pattern blocks and three weeks to deliver! There was little chance that a factory would be able to make such a bespoke order so I placed an advert for knitters in Islington library (this is the early 90’s before internet was widely used.) Amazingly I received calls from knitters all over North London. Three weeks later the waistcoats were dispatched to New York, London and Paris. Over the next few years I worked on some exciting collaborative projects with Paul Smith, jumpers for Paris fashion week, embroidered suiting fabrics for Pitti Uomo Florence and produced collections of waistcoats under my own label for his shops. One of these waistcoats was awarded 1st prize in the Pantone colour awards receiving reviews in the Times, Creative Review and Arena menswear magazine. As the orders grew, I began employing freelance designers and students, some from Brighton University. We started exhibiting at London trade shows including Top Drawer, receiving orders from department stores such as Liberty’s, Harvey Nichols, Takashimaya and Lane Crawford, exporting to Canada, US & Japan. You are now based here in Brighton again – can you tell us a bit more about your design business here? I now have a space at Cross Street Studio’s. It is wonderful working in a shared workshop with other designer makers from diverse disciplines, including jewellery, textiles and carpentry. It is important to me, to be making products that I feel happy with, not just from a design perspective but also ethically. I have been working with wool for years and it really is a wonderful fibre, totally biodegradable, sustainable and renewable. I am now sourcing yarn from British mills that only spin certified high welfare merino wool and use dyes that conform to European standards. Where else can we see your work regularly in Sussex? You can find my scarves on permanent display at Hove Museum & Art Gallery in the 1st floor Craft Gallery. I regularly show at Architectural Plants Festive Fair – buyers flock to this beautiful venue near Pulborough to see artists and makers, sample artisan food & drink amongst the lush Mediterranean palms and olive trees! Over the past few years I have been selling more locally and making blankets, coats and accessories to order, here are some of the shops and galleries I have worked with: the lovely I Gigi General Store in Hove, Charleston shop and Ditchling Museum & Art Gallery, I also sell online via my website. What’s your favourite thing about exhibiting in the Artists Open Houses? My favourite thing about exhibiting in the Open Houses is the moment after months of preparation and put the finishing touches to my display, when I can finally switch mode and enjoy 3 weekends meeting new and existing customers! There is always a buzz at the Christmas AOH’s and I’m looking forward to the mulled wine, mince pies and a chance to buy gifts from some of my favourite makers! The post Knitwear designer Jo Cranston tells us about exhibiting in 3 Christmas Open Houses! appeared first on Artists Open Houses. Dermatillomania AKA Skin Picking: What Is It & How Do You Stop It?